NEW YORK (Reuters) – U.S. consumer sentiment rose in late September to the highest since January 2008 as expectations of an economic rebound gathered momentum, a survey showed on Friday (see chart above). The data added to indications the economy is pulling out of a lengthy recession more powerfully than many analysts had expected a few months ago, although doubts persist about how much staying power the rebound may have. 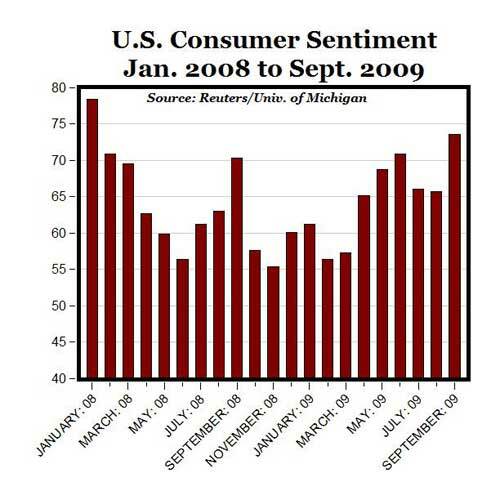 The Reuters/University of Michigan Surveys of Consumers said its final index of sentiment for September rose to 73.5 from 65.7 in August. This was above economists’ median expectation for a reading of 70.3, according to a Reuters poll. 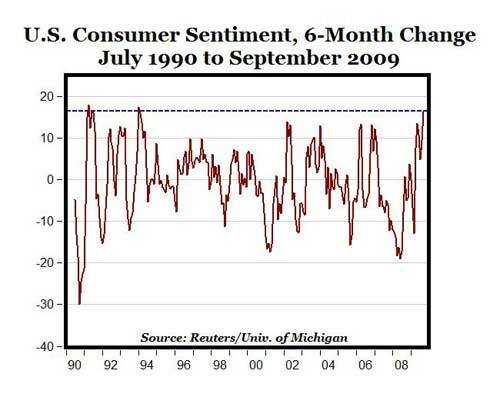 MP: The 16.2 point increase in Consumer Sentiment from 57.3 in March to 73.5 in September of this year is the largest six-month gain in consumer confidence in 15 years, going all the way back to January of 1994, and it’s the third biggest 6-month gain since 1990 (see chart below). 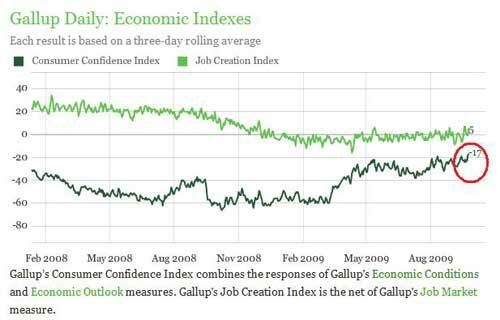 The Gallup Consumer Confidence Index is also at the highest level since January 2008, (see chart below).